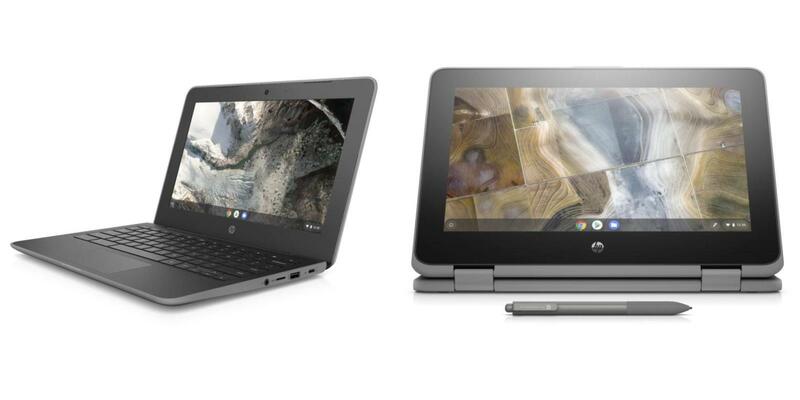 Today HP announces two new Chromebooks in its ‘Education-Edition’ lineup. Both the HP Chromebook X360 11 G2 And Chromebook 11 G7 features durable build, rugged body with a spill-resistant keyboard, shock-absorbing trims and drop resistance. The new Chromebook 11 G2 is the convertible laptop. This means you can use it in a tent mode, tablet mode, and traditional laptop mode as well. The Company focuses on the build quality of the device and boasts of an IP41 rating. The successor of two-year-old G1 provides you options for both a Wacom pen as well as a signature 5-megapixel rear-facing camera. The device comes with 64GB of internal storage (expandable) and 8GB RAM (rare in budget Chromebooks). Further, It is powered by either a dual-core Celeron N4000 or quad-core N4100. The 47.36 Wh Li-ion battery claims to provide a battery life of up to 11.5 hours. Another Chromebook announced is HP Chromebook 11 G7, packs more traditional factors with the same build, durability as HP Chromebook 11 x360 G2. Same characteristics mean it features MIL-STD 810G-rated build, spill-resistant keyboard, and rubber trims on the side. However, It rotates only 180 degrees and is available in non-touch versions. Non-Touch versions result in better battery life of up to 13 hours. It is powered by N4100 or N4000 processor, coupled with up to 8GB of RAM. It packs 64 GB of expandable internal storage. The port options and battery capacity remain the same as the HP Chromebook 11 G2. The Company has not revealed the pricing for its latest Chromebooks. However, Both will hit the market in April this year. The laptops are for institutions that will likely be purchasing in bulk, basically for school children. The fact that they will be available for sale in stores remains unclear.